Do you make goals? If so, how? Do you tend to crush them all, or do they just kinda float around in your head until you get interrupted by a kid who desperately NEEEEEEDS you to help them find that one little lego piece RIGHT NOW? As a mom, it’s so easy to get caught up in the day-to-day. It’s hard to know what kind of goals to make, and how to make them, let alone how to stick to them! 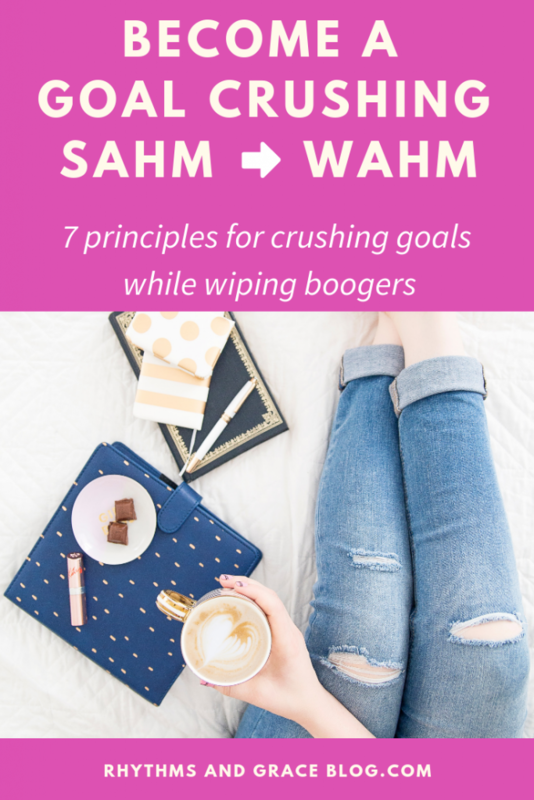 But, spending many-a-day spent wiping orifices and rocking babies doesn’t disqualify you from becoming a momma who can make goals and crush them! 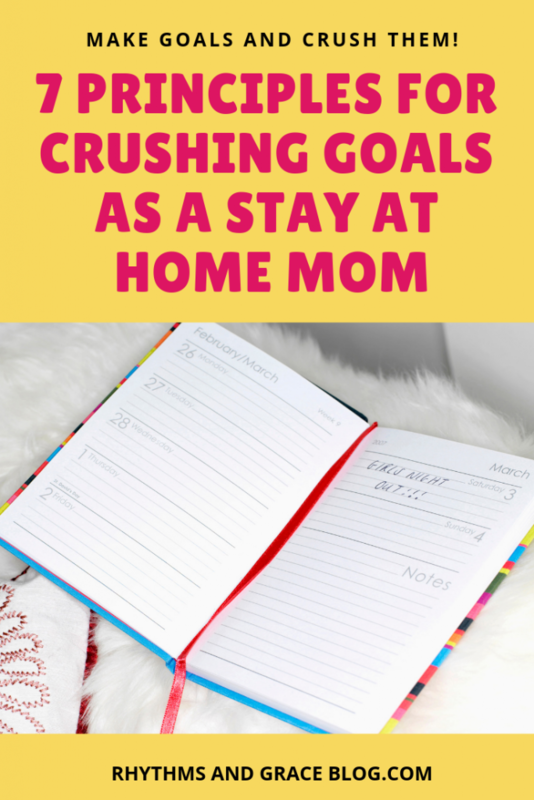 In fact, I’m pretty darn sure that if you can simultaneously pick boogers off the toddler while holding the baby and teaching the preschooler to get her own pants on, then you can sure as heck write down some goals and start crushing them. 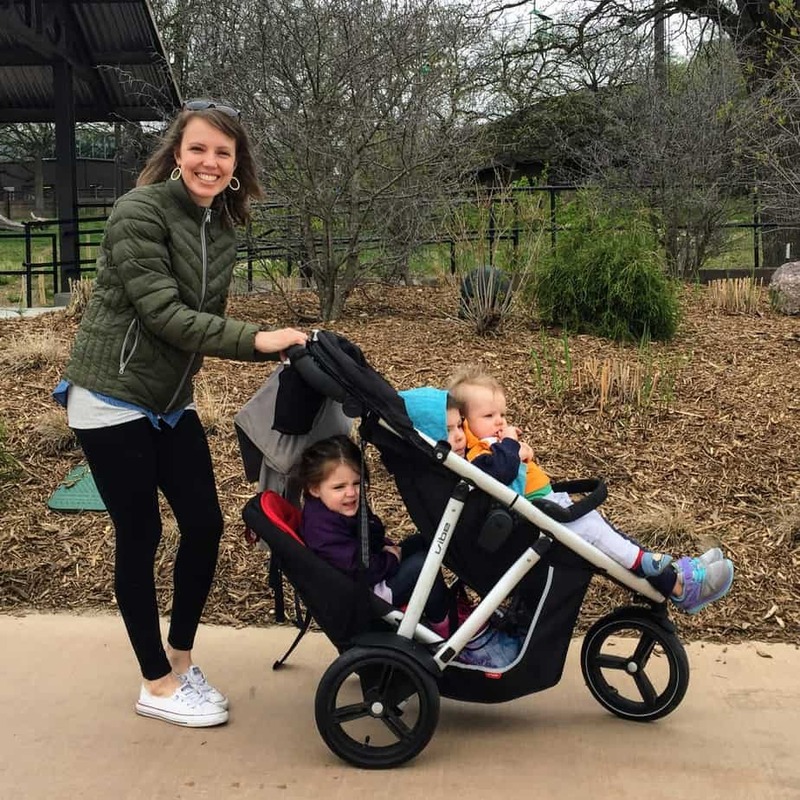 I have tried ALL THE THINGS the last several years of having babies + blogging on the side. I’ve listened to goal-setting podcasts, read all the books, dominated some goals, massively failed at others… and everything in between. But one thing I love is the chance to help other mommas learn from all my trial and error! 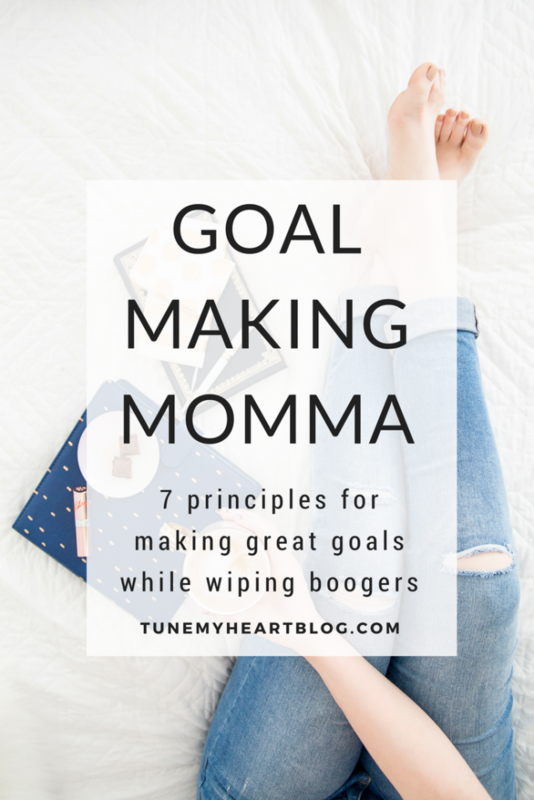 So without further adieu, my 7 best goal setting principles… mom edition. The first year I made “New Year’s” goals was 2015. New Year’s is in quotes because I made them in April. 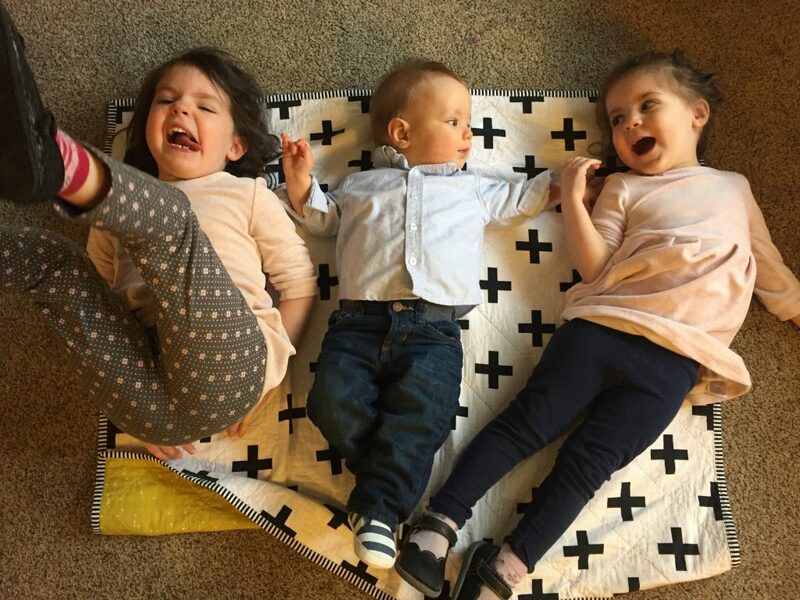 Our second baby was approaching 1 year old, and I finally felt like I had a handle on the whole stay-at-home-mom of 2 under 2 thing. But you know what? There are still 8 months in a year after April. It’s never to late to start goal making. Whether you’re ready to make some goals in January, April, or November, just start. Whether you’ve failed at keeping goals in the past or never made a single goal in your entire life, just start. Start the process now. When I first sat down to make some “New Year’s” goals that April, I was super pumped. After having 2 babies in 16 months, 2 cross-country moves, and starting to tackle a pile of student loan debt, I finally felt like I could think about the future. Cute notebook, favorite pen and coffee in hand, I was ready to dream. But, I quickly felt discouraged. As I wrote my dreams down, I realized many wouldn’t happen in the following 8 months. The problem was, many things I wrote down were dreams. Not goals. The distinction is fuzzy, but here’s how I separate them when I’m making goals. I treat dreaming as a big-picture, pretty-fuzzy, brain-dump thing. Sometimes my husband and I dream about our future on a date. What do we imagine our life looking like? Sometimes I dream about this blog/ business? I’ll just brain-dump in my journal about who I hope it reaches or what impact I hope it will make. Dreams are in our heads. Goals, on the other hand, are concrete. They’re written down somewhere, and I’m tracking the progress on them. For example, my husband and I dream of being totally debt free, living on 50% of our income, and giving the other half away. But we’re not quite sure when or how that will happen. A more concrete long term goal we’re working towards is paying off student loan debt as fast as possible. Our specific goal was to be debt free 5 years from when we started the payoff. We’re on track to be debt-free 2.5 years from when we started! UPDATE 2019: We paid off all our student loan debt in just under 2.5 years. BOOM!! Whatever your crazy goal is, YOU CAN DO IT!!!!! Your long-term goals should be related to your dreams, but they’re not one in the same. The debt-free goal is connected to the long-term dream, but we don’t spend a lot of time or energy on the dreaming side. The bulk of our time, energy, and focus goes into the long-term goal. So, all my goals for a particular year are short-term goals. Our 3 year debt-payoff goal was a long term goal. The first year we tackled our debt, we set a short term goal to pay off 1/3 of the debt that first year. We ended up pay off more than that! Do you want to know a secret? I’d love to open a school some day, if God wants me to. But… Now is not the time for me to have that goal. It’s not really even the time to take beginning steps towards opening a school. And that’s okay. It’s okay to have crazy big dreams. And it’s okay for some of them to be on pause. Sometimes your long-term goals and dreams conflict with one another, and you just have to work on one at a time. Give yourself permission to hit pause on some goals while you work on others. Contrary to popular, well-intended messages that are bombarding young moms, you just cannot have it all. And especially not all at once. The dreams of what we want for our family lead to the long term goal of me being our kids’ primary caregiver during these formative years. The fact that we can even have that conversation and choice is a massive privilege. My short term goals have to be reflected in that long term goal. Which is why I spend the bulk of my waking hours (and even some of my sleeping hours) taking care of our littles. They’re little right now. They’ll be big in 20-ish years. I can open a school, or whatever, then. Look over the dreams you listed… do any of them seemingly conflict with each other? Is there a way to work towards two of them at once? Think about what season you’re in and what is realistic for you. Categories are not a must, but they can be helpful, especially if you’re a new goal making momma. 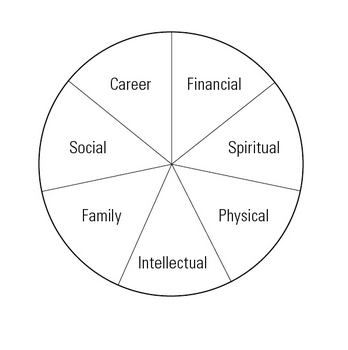 Zig Ziglar’s “Wheel of Life” is a good starting point. Within those categories, dreaming is good. Spend an afternoon alone or with your spouse or best friend and just dream away in each of those categories. But then, narrow it down. At some point, get by yourself, zoom in and choose a couple things to focus on for now. Which brings me to goal making principle number 6. Simple will vary from person to person. For 2 years, I made 1 goal in each of those 8 categories. In 2017, I chose one word to dictate all my goals. It was the year of FOCUS. Maybe you only want 3 categories. Maybe you want to choose a word. Just keep your goals simple. Less is more. What exactly do I want to accomplish? Why do I want to accomplish this? How does it connect to longer term goals and dreams? Having a measurable goal makes it so that you can track progress and continually evaluate what you need to do to hit your goal. But, we started a spreadsheet and entered the total we owed on each loan in a separate column. We recorded every single payment, whether $50 or $1,000. And we recorded the new total balance owed with interest. Slowly but surely, we watched the total balance go down. And pretty soon, when we’re out of debt, we will watch our savings goals go up. 2019 update: we tracked all our debt paydown on a basic spreadsheet and it was AWESOME to finally get the number down to zero. Figure out what the measurement will be and how you’re going to track progress. This process will likely be a little trial-and-error to figure out what works for you. In 2017, I took a totally different goal-making approach, and set the word focus over my entire year. Here’s what that process looked like, in case that’s more your style. Your goals don’t have to revolve around years either. 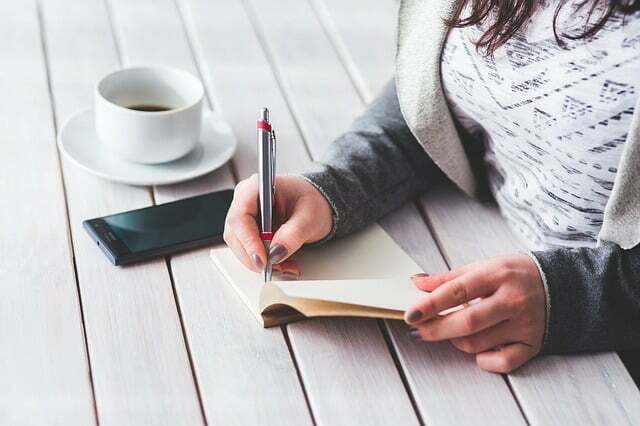 I’m currently make quarterly goals for my blog, and as we’ve neared the end of debt pay-off our goals span a month or two at a time rather than a year. 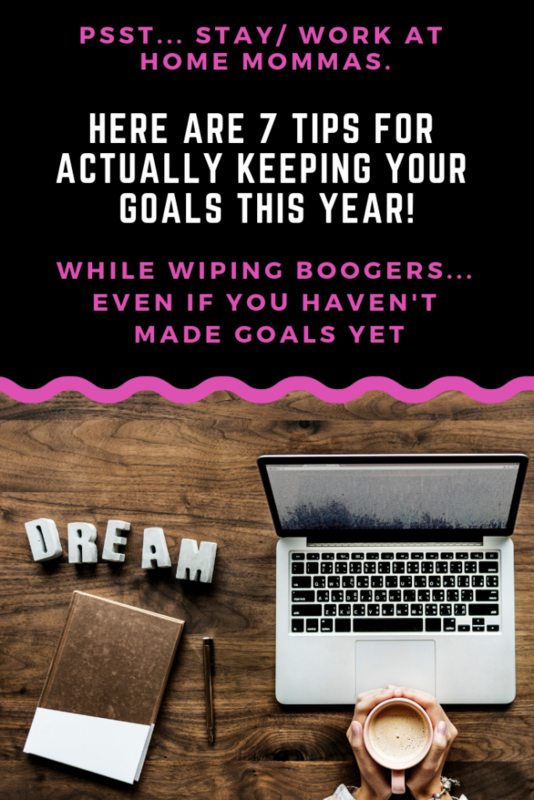 I’d love to know what your goals are or how this post helped you get started with goal making! Share in the comments below or better yet, sign up for my and let's get in touch over email! 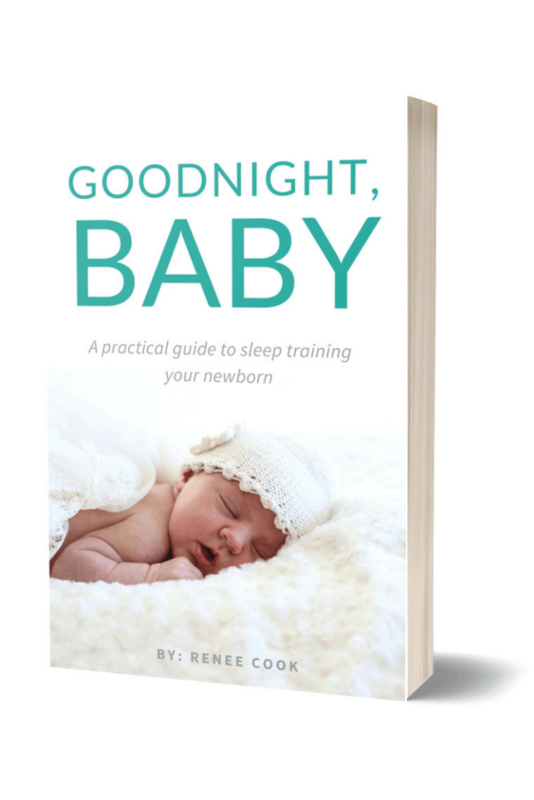 If you ever feel overwhelmed in your everyday mom life, try my free email course. I can't promise to eliminate all overwhelm, because, well, kids will be kids. BUT, the principles and tips I share in this course have transformed me from a crabby & stressed mom to one who enjoys my kids... most of the time! Start the 5-day course today!